WHEN: April 13 - May 13, 2017; Thursdays at 7:30pm, Fridays and Saturdays at 8pm, and Sundays at 3pm. Special matinee performance on Saturday May 13th at 3pm. Paralyzed in the car accident that claimed her mother's life, 17-year-old Ellen is determined to experience all her teenage years have to offer. But when the past comes knocking on the door in the form of Ellen's brother, her small family's delicate balance is upended. 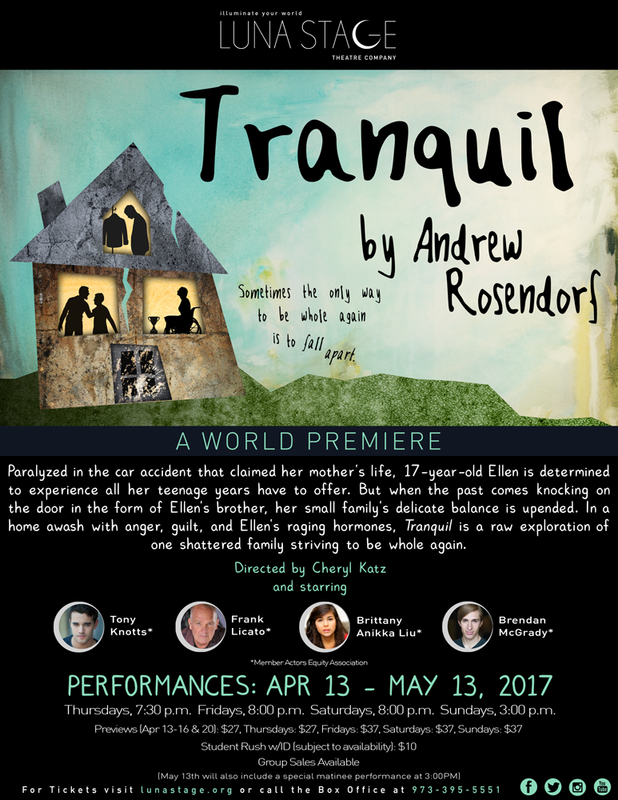 In a home awash with anger, guilt, and Ellen's raging hormones, Tranquil is a raw exploration of one shattered family striving to be whole again. Please note, this play contains mature situations and frank sexuality.